Come join us for Spring Break at Emergent Arts! Students ages 5-14 are invited to come get creative during Spring Break. Camp will run from 10:00am – 2:00pm on Tuesday, March 20st – Friday, March 23th. Students will participate in a variety of art classes throughout the week. All materials and snacks will be provided but students should bring a sack lunch each day. Tuition is $80.00 per student. Scholarships are available. For more information please visit the registration page HERE. Call for Spring 2018 Class Proposals! Calling all artists! If you have ever considered teaching a class at Emergent Arts please consider submitting a proposal. Emergent Arts is requesting proposals from Teaching Artists in all disciplines of art for the Spring 2018 semester. 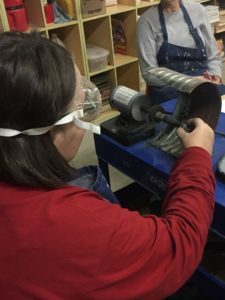 Classes and workshops offer emerging artists of all ages exciting opportunities to explore various mediums and themes that are relevant to their age group and skill level. Proposals for all types of visual and performing arts are welcome. Our Spring 2018 calendar runs from February 6 – May 25. Classes can span 4 weeks or up to the full semester in length. Please see our proposal form below for more details. Applications are due Friday, November 10th. Adults get to play too! Our fall classes are well underway! There are quite a few classes for adults which can be joined at any time. We invite you to come by Tuesdays at 7 p.m. during September for our Words and Wine writing workshop. In October, treat yourself on Tuesdays at 7 to Drink and Draw. If you are looking for some movement, stop in Wednesdays at 6 p.m. for Coalescence Belly Dance, or join us for Tai Chi Sun Style at 5:30 on Thursdays. Check out the education tab on our website for more information. We are excited to offer FOUR different Summer Camp experiences at Emergent Arts this year! Registration for all camps is NOW OPEN! We hope you can come and join us! Today is the day! Please visit https://www.arkansasgives.org/organizations/emergent-arts to donate to Emergent Arts. GREAT NEWS! We have a $5000 match from the Morris Foundation! Double your donation today! Your donation will support our ongoing programming and new projects like our outdoor classroom, accessibility improvements, and the ARTMOBILE! Emergent Arts is pleased to announce a Request for Teaching Artist Applications for Spring Break Camp 2017 and Summer Camp 2017. Spring and Summer Camps are for students age 5 to 14. Emergent Arts is requesting applications from interested teaching artists in all disciplines of art to join our staff for Spring Break 2017 (March 21st – 24th) and/or Summer Camp 2017 (July). Classes and workshops should offer student artists exciting opportunities to explore various mediums and themes. Although camps are primarily visual arts based, applications in all types of creative writing and visual and performing arts are welcome. Applications for Spring Break Camp are due by Monday, March 6th and Summer Art Camp are due by Monday April 3rd. All applications will be reviewed by the Programming Committee at that time. Interested individuals must submit a letter of interest and resume, c.v or biographical information to support your qualifications as a teaching artist. Emergent Arts fosters creativity for emerging artists of all ages in Garland County and surrounding communities. They do this through a dynamic program of classes, workshops, gallery exhibits, and studio space. For more information about the organization and their programs please visit www.emergentarts.org or stop by the gallery at 341-A Whittington Ave.
February is in full swing! The Spring 2017 semester is in full swing at Emergent Arts and February has been a busy and exciting month! We’ve enjoyed having new and returning kids in our Drawing (Kay Watkins), Painting (Jeri Hillis) and Clay(Jeri Hillis) classes. We’ve also had a full slate of adult classes including Painting (Jeri Hillis), Clay (Jeri Hillis) and Jewelry Making(Chris Watkins). This semester we’ve also had several classes that encourage students to “drop in” if they cannot commit to all session meetings. Such classes include ATS (American Tribal Style) Belly Dancing Level 1, Dancing in Flow (informal Belly Dancing practice) both taught by Gianna St. Grace as well as Tai-Chi Sun Style taught by Barb Schuette and Jerry Matlock. And, of course, Words & Wine with Kai Coggin started back in February and will happen again in April! If you weren’t able to join us this month we hope you can in March! We have several new classes starting next month including: Children’s Yoga, Drink & Draw and Improv Jam! Come join us for Spring Break at Emergent Arts! Students ages 5-14 are invited to come get creative during Spring Break. Camp will run from 10:00am – 2:00pm on Tuesday, March 21st – Friday, March 24th. 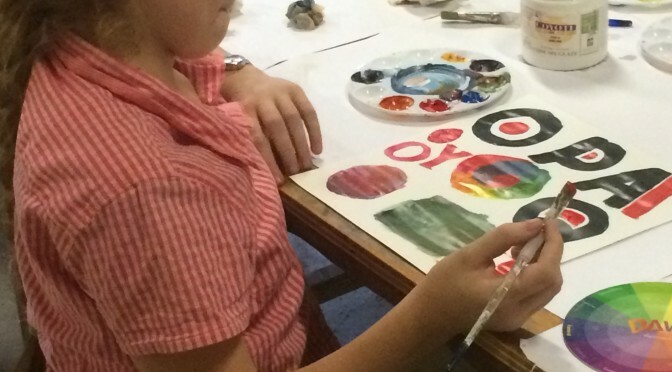 Students will participate in a variety of art classes throughout the week. All materials and snacks will be provided but students should bring a sack lunch each day. Tuition is $80.00 per student. Scholarships are available. We are excited to announce that our Spring 2017 class schedule is set and registration is now open on the website! We have a wide variety of engaging visual, performing and literary arts classes led by a talented group of new and returning Teaching Artists slated to begin in February. Please visit our Arts Education page to learn about upcoming classes and register online! One man’s trash, is another man’s ART! This is a great way to look for holiday gifts and find art making materials. Please consider donating your interesting and unused items. Donated items must be delivered by 5:00 p.m. on Wednesday, November 23rd and it is appreciated that you call ahead of time before delivery. Please pre-price your items for sale in order to assist our staff and volunteers. If you would like to volunteer contact us for times and tasks. We will need volunteers prior to the sale for organizing and set up as well as the day of the sale.